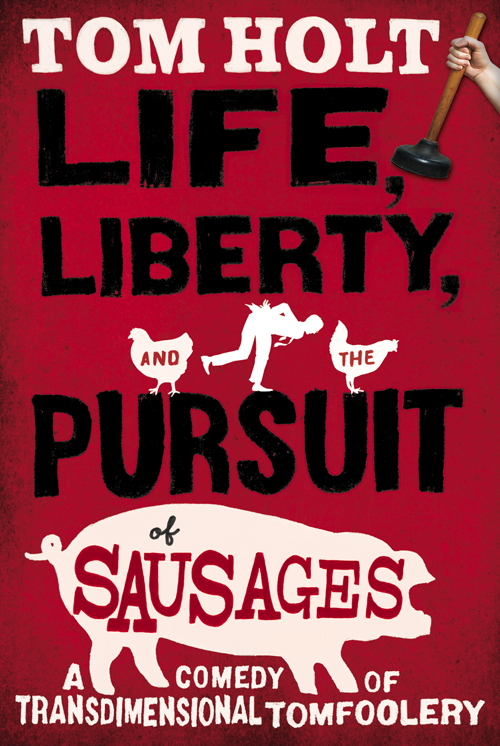 I had the opportunity to read a galley of Tom Holt’s hilarious Life, Liberty, And the Pursuit of Sausages last week and am squeaking this review in just before the book is actually published on February 21st. Picture Indiana Jones, sliding beneath the closing stone door in the hidden corridors beneath the palace in The Temple of Doom. Okay… this isn’t really like that, but that was a great scene, you have to admit. I requested this galley largely in part due to the suggestion of a good friend who had the chance to read the book before I did and I’m exceedingly happy that I did so. Despite, or more likely, because of the many mind-warping aspects of this story, I highly enjoyed reading, puzzling over and laughing with-though never at-this book. Polly, an average, completely ordinary real estate solicitor is convinced she’s losing her mind. Someone keeps drinking her coffee. And talking to her clients. And doing her job. And when she goes to the dry cleaner’s to pick up her dress for the party, it’s not there. Not the dress – the dry cleaner’s. More than a magical ring, indeed. Perhaps a magical… pencil sharpener? Sure! Why not?! Between a dry cleaner’s that relocates at random, a housing development that periodically disappears while the pristine, untouched land where it used to be comes up for sale again, and a couple of knights that have been duking it out for hundreds of years, in the dry cleaner’s toilet, no less… there’s plenty going on to keep one interested. There’s a real estate solicitor who keeps finding her coffee cup empty to the one that keeps finding hers full… what’s funny is that they work in the same office. Literally, in the same chair at the same desk talking on the same phone in the very same office. At the same time. But they’ve never met. Something is certainly odd! The absolute silly kept me laughing and more importantly, kept me reading. The sheer ‘what the hell is going on?’ feeling that the bizarre events elicited in me was plenty to keep my interest up and keep me reading. Despite jumping from character to character, at times right in the middle of a sentence, it didn’t make the flow of the story any more difficult to follow. Was I confused by the events of the story? Sure. Was I interested in the plight of the characters? Absolutely. Did I enjoy the hell out of it? You know I did. I generally take breaks between chapters as long as the ones in this book but upon scanning the first sentences of a new chapter, I was sucked in and just had to find out what mind-boggling events would transpire next. Definitely a fun read and you can choose to either fly through it or stop between chapters to ponder the possibilities… and the ridiculousness of such expensive sausages! This entry was posted in 50 Books, review and tagged 50 Book Challenge, book reviews, fun, galley, humor, Tom Holt. Bookmark the permalink. Ok, sounds fun, but does it end? I mean, does at least some of it start to make sense when you get that far? Oh yes, Holt wraps it up nice and tidy… in a manner of speaking! But it’s a humdinger of a ride to get there! It does end, as Paige said. The bits and pieces start to come together as the POV shifts between characters, and you (and they) start to understand how everything interconnected. There’s a nice resolution…the sort that wraps up the immediate mystery/problem without shutting down the whole world. If that makes sense. …have you read any Christopher Moore? His humor jives pretty well with the humor here. And there’s often a “wtf?” and/or “I can’t believe he just did that!” factor in his novels. I think you’d like at least some of them. I haven’t yet read any Moore, but he is on my to-buy list! Now I’m interested in this! Sounds like my kind of humor! Bookmarked to read – and I can’t wait!